This post was first published for Thanksgiving 2013, the year I began blogging. I did not know many of you as friends then, so I’m posting this again for our season of gratitude in 2018, keeping in mind those victims of California wildfires and senseless shootings. May we find a tangible way to help them and others in need. Let me use reproach as material for long-suffering. “Keeping company with God” is the title of Part One of Philip Yancey’s book with the arresting title Prayer: Does It Make Any Difference? He discusses also the language of prayer and the dilemmas of prayer including what one should pray for, the enigma of unanswered prayer, and “un-prayed answers.” (220) Ah, the mystery of talking to God. Over the years, in fact since 1984, I have accumulated prayer cards, some printed with typewriter ribbon and later ones two-sided and computer generated. Most of what is on the card are names of family and friends who need help, but sometimes there is a condition humanly unsolvable that I pray God will remedy. 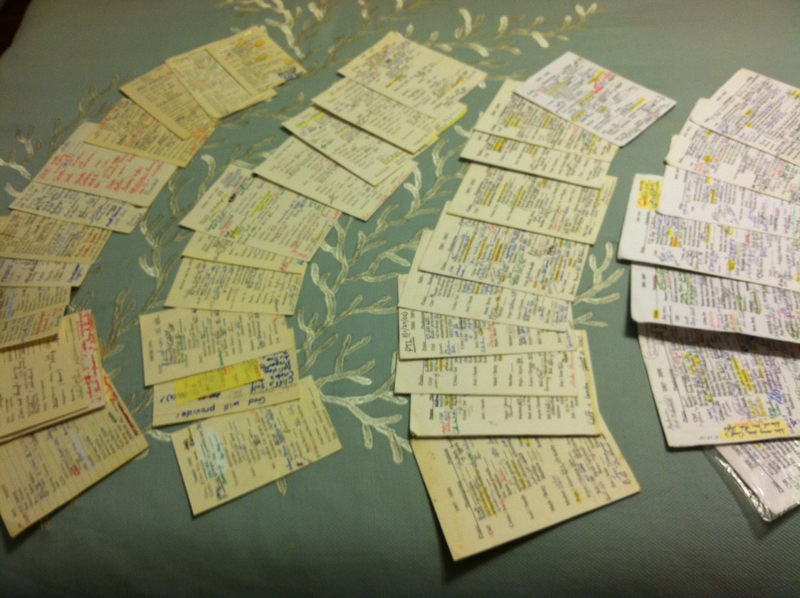 The cards are speckled with dates recording what I regard as answers to prayer. How soon we forget. How necessary to remember! During this Thanksgiving season do you have a story, long treasured in the family or a newly minted one to share? We’re ready to listen! What a beautiful testimony to the power of gratitude in your life and in the world, Marian. I love the wideness in your vision. I keep a journal sporadically, and it is often filled with my moments of wonder, ecstasy, delight in silence, and gratitude. But I feel ready to be more disciplined in both recording my gratitude and in recording prayer. Those cards of yours are amazing! I also loved the picture of the little girl\’s hands in prayer. Her red polish. The \”baby fat\” still protecting her body as her innocence protects her spirit. Having just returned from a weekend in NJ with grandchildren, my story of gratitude is recent. I am grateful for eyes that light up and arms that surround me and for the new name \”Grammy, Grammy!\” spoken with such excitement from a little one that he has to jump up and down while he says it. I think that\’s the kind of enthusiasm God loves to see from me, too. Thank you for your comment, Shirley. I can always count on your for an insightful assessment that widens the story. You mention \”enthusiasm\” at the end. I think that\’s what it is all about: en-THEOS-iasm, the essence of God\’s character. Soon that little boy will almost knock you down as he flies non-stop toward you for a hug. Ian, age 6, case on point. My children went to parochial school for their first six years plus 4 and 5 y o kindergarten. They learned to love God and to know Him. My daughter now has a three year old and we say a prayer together everytime she goes to sleep at my house, but my daughter doesn\’t teach her, and has issues with it. I don\’t understand it, except to say her values have changed. I feel sad about that because I worry where her children will find their strength. Susan, that’s why children have grand-parents like you. You are planted in her life to help give her roots and eventually wings to fly as a whole person one day. Thanks Marian. That\’s what I like to think also. This poem has a similar cadence to the one by John Baillie on this post. They both show such a keen dependence on God. I read Yancey\’s book Where is God When it Hurts and loved it. One of the biggest obstacles between humans and a relationship with God is reconciling suffering. As Thanksgiving approaches, I think of all the things that I\’ve learned during the times that I\’ve suffered, and I\’m grateful. It\’s hard to feel that way during the pain, sometimes you\’re just holding on day by day, but I cling to the assurance that He\’s working all things for my good. Yancey is not afraid of confronting hard questions with other titles like Disappointment with God and Church: Why Bother? His books are always well researched with copious notes for each chapter yet with an engaging, narrative style. It\’s good to know there are other pilgrims on the same journey! Beautiful post, Marian. I have vivid memories of talking to God before snack time. Great photo! One Thanksgiving that stands out was over 20 years ago. Somehow we got locked out of my parents house and boy was it cold! My sister and her husband had a tiny bright red rental car, which all nine of us packed inside and drove to their house to get a spare key. The photo comes from the 2-year-old class at my church. I’m glad it evokes happy memories. Packing 9 people into a rental car must have brought instant warmth (in more ways than one} on the trip to retrieve a spare key! May you have a restful Thanksgiving, Jill! Good morning, Marian! Happy Thanksgiving to you and your family! 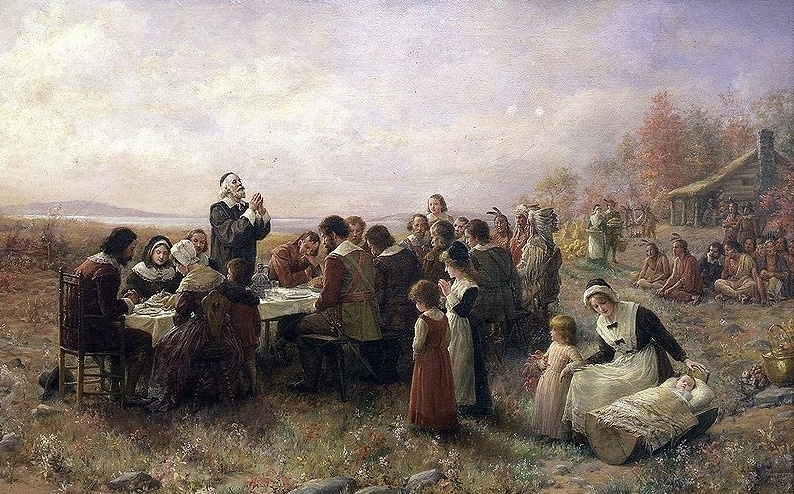 I am grateful for my family–and our traditions. My niece is picking up my mom today so she can be there when they make the cranberry squirrel (you probably remember that). It’s sort of a bittersweet endeavor, fraught with emotions since my mom at 96 is fading and doesn’t move around very well. Your family has wonderful traditions, and I can picture the cranberry squirrel from another year – ha! I know you are grateful for your mother’s presence even though she is “fading,” as you say. My mother’s photo greets me when I walk by the bookshelf every day. I certainly do miss her; maybe I’ll take a placecard with her name on it to our Thanksgiving feast tomorrow. How lovely to see this post! Love your prayer cards! I keep a list on my computer. My family has been so scattered over the years. When we get together, the only tradition we have is prayer. When we can’t get together, we pray with each other over the phone. Philip Yancey has some great books! Have a wonderful Thanksgiving, Marian! I’m glad you can connect to many thoughts on this post. Your family has a vital tradition in keeping a prayer circle – talking and listening and keeping the connection strong. Happy Thanksgiving! Happy Thanksgiving, Marian, and may the Lord be with you and your family. It has been a great pleasure getting to know you these last several years, reading your thoughtful and intimate blog posts and, of course, your memoir of growing up in rural Pennsylvania, in itself, a magical place that never ceases to fill me with wonder when I drive through it, past the farms, the stone houses, the cornfields and the churches. Thank you for all of this, Susan. I feel the gratitude across the miles. Yes, you are blessed in many ways: caring sons that resemble their father, a pet that provides comstant company, and amazing writing success. I know Canadians celebrate Thanksgiving earlier in the month, and it seems to me you posted a piece about Thanksgiving in Spain. One thing for sure: I always sense an attitude of gratitude on your blog. Thanks, Darlene! Truly I wasn’t acquainted with you when you posted this! Although I think I went back and saw it at some time. I am grateful for your faithful blogging, commenting, and this virtual friend I’ve made. Hope you and your family have a lovely time on Thanksgiving and this weekend. Thank you, friend, someday we may meet person. I’m overdue for a trip to the Harrisonburg area. May you have a wonderful Thanksgiving day, Melodie. With all of those grandchildren in your expanding family, it will certainly be joyful, but probably not quiet! Well, Kim, it sounds as though you are hosting the Thanksgiving dinner this year. I’m glad this meditation helped you focus as you begin the meal preparations. Enjoy the season with your family! Marian, this is a beautiful post—well worth reblogging. Gratitude is timeless and something we all need to be reminded to look to. There is always, always something to give gratitude to the Creator for. As you head into Thanksgiving, I wish a blessed one for you and Cliff. I’m glad this post touched a chord. Your daily meditations do the same for me. As a Canadian you observed the season earlier this month, but still had a day of celebration with Gerry’s birthday. Thank you for stopping by today with warm thoughts, Linda. I too keep a gratitude journal – I don’t always record in it but when I do, I surprise myself (which takes some doing) .. the small becomes larger. Thank you for your reflection on several of the authors here, Susan. I smiled when I read your observation that “the small becomes larger” when you review what you’ve written in your gratitude journal. And thank you for reminding me of Harold Kushner’s book When Bad Things Happen to Good People. I notice that his publisher is coming out with a 20th anniversary edition. Oh, my goodness! That purple journal with the lilacs on it is one I have in my journal collections as well! It was one my mother used in her last days with us. 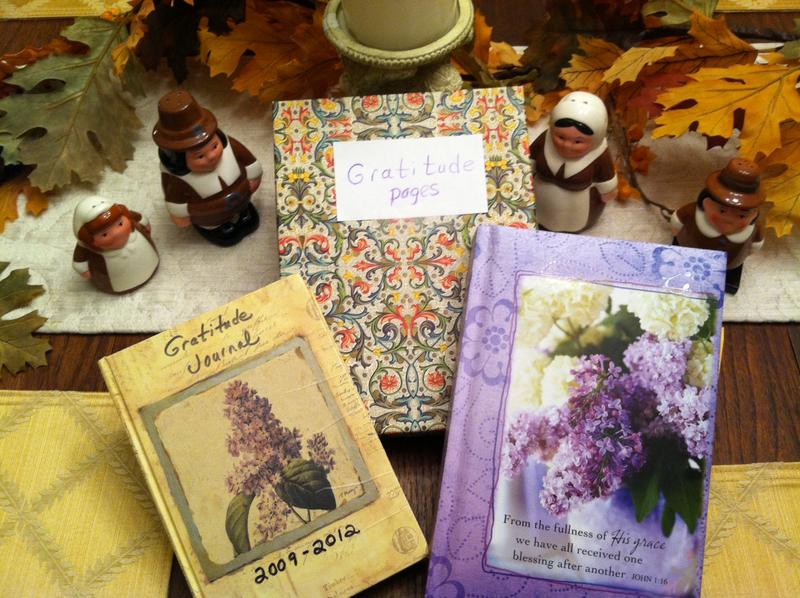 How wonderful to know that you are recording blessings in journals too, even a lilac one like mine. Did I tell you I have another one for “rants” – actually recording problems that seem insurmountable at the time but in the end, either a problem solved or one I must choose to live with. Like you, I admire C. S. Lewis’ writings. He is always transparent and unafraid to show vulnerability. Beautiful post, Marian and a great reminder to be grateful to God for many blessings. No matter how bad the circumstance , there’s always a reason to be grateful. Although life hasn’t turned out like I had hoped, I can still look around and see so many things to be grateful for. Love your prayer cards and the photo of the child praying with those chubby little fingers. Thank you and Happy Thanksgiving to you and yours. You have no idea what an encouragement you are to me and many, many others ~ smiling “through it all.” I told my photographer son Joel I want an author photo like yours, which I think is such a flattering pose. Blessings to you and your family this Thanksgiving, dear friend! Oh, thank you for your kind and generous words, dear friend. You are so special to me. Wishing you and your family a great and grateful Thanksgiving, Marian! You’re welcome, Jack. I’m glad we have re-connected here again. I enjoy your Facebook postings, sometimes with exotic scenery. Happy Thanksgiving to you and your family too! Marian — I enjoyed reading this post of gratitude. I’m grateful to know you. Happy Thanksgiving to you and yours. I’m grateful for our friendship, and for your spurring me on to live me best life. Because of you, I’ve offloaded so much baggage, felt lighter, more free! This Thanksgiving will be especially memorable with Luna Bleue as a new blessing this year. Thank you, Laurie! Thanks for sharing the post again. I usually struggle with gratitude, which is why this year I’ve tried to create a system which can kick start it into place and get it going, even if I’m not necessarily feeling thankful to God at that particular point. I know that once I begin expressing gratitude, then the feelings can follow until it becomes a well-formed habit. You are right, Robert, about the expression –> feelings –> habit sequence when it comes to gratitude. I also enjoyed reading your comment on Mary Ann’s blog. Happy Thanksliving! I like your list of gratitude. Thanks for sharing it again. My only interesting Thanksgiving story is from a few years ago when we were invited to join some friends, and their family, at their house. Among the guests was an older woman who had grown-up as a child during WWII in London during the blitz. This woman was a delight and regaled us with her stories [from a child’s point of view] of survival, despite the destruction and deprivation around her. While this may not seem like a Thanksgiving tale, listening to her was a good way to gain renewed appreciation about how good we have it now– and the need to be grateful every day. This IS definitely a Thanksgiving tale. Thank you! How fortunate you were to hear these stories first hand from a woman who experienced deliverance during the blitz. You made me think of H. A. and Margret Rey, who escaped Paris on bikes with their Curious George manuscripts during World War II. Happy Thanksgiving to you and yours, Ally! I love all of the quotes and prayers in your blog this week …you are a wonderful collector of words Marian . I have come to believe that everyone talks to God – even those who say they don’t believe in a God or God-ness in any way. Something as simple as the plea for the light to stay green until we get through it is a plea prayer, and the “Thank you!” when it does is a gratitude prayer. I think it’s innate. I prayerfully say thank you for the enlightenment you bring to me through your blog. Aww, thank you, Arlene. It’s true, all creation proclaims the existence of a Power way, way beyond ourselves. And like you, I believe people regardless of their religious beliefs or lack thereof, innately know that to be true. Have a wonderful weekend, Arlene! I like those gratitude notebooks. Yesterday, my son invited me to come with him to a friend’s home. My other son and his wife were in North Carolina as they usually are for Thanksgiving and will come for Christmas. I attended a congenial feast with every possible traditional Thanksgiving food. There was an awkward moment as we quieted down at our places, but my son (bless his heart), held out his hands and grabbed the hands of those sitting next to him. I grabbed hands. Everyone did. We silently paused, looked around the table into each other’s eyes, took a deep breath, and nodded our silent thanks. That moment and the apricot full moon rising in the east were the take-away gifts of Thanksgiving this year. Thank you for supplying the colorful details behind the lovely photos you posted on Facebook.You have abundance in every way. I noticed a most poignant touch: Your daughter-in-law mailing acorns because she knew you had none. Long live your gratitude ritual, Elaine! My gratitude contains daily thoughts of realizations in regards to the small things in life that make me happy (like a hot shower every day and unlimited water, electricity and internet), a smile when I look at my beloved husband, or a written “thank you” or other note when I appreciate what someone does or did for me, animals or the world. You have wisdom beyond your years, Liesbet. Many older folks take for granted a daily hot shower, electricity, and the internet. And then the blessings of your husband’s countenance, beyond value. I look forward to seeing your blog next week. Just taking a wild guess, you’ll have yummy pics of the baking Thanks for stopping by, Jenn! Just as good the second time around. Thanksgiving’s gift of leftovers that never end! Ah, Shirley, you have bookended this blog post just as you have done last week, celebrating Thanksgiving and Christmas days apart. I’m just now catching up with you on Facebook and Instagram. Today Cliff and I remembered our first meeting December 18, 1965, a Saturday, according to the digital calendar. I met you (my best guess) November 2012 when I attended a “What the Heck is a Blog?” at a UNF mini-course. How I treasure these magical moments of connection. Serendipitous . . . and sacred! Prayer (to me) is such a personal moment (or hour). I love how you write about prayer here, from the child’s first pudgy hands held together, to adults trying to stop “trying to understand’ but instead, letting it go to a higher force, a spirit who surrounds us, invisibly, yet noticeably, if we stop. Pray. Feel. Love. I pray best when I go for a walk and send out my thoughts of love and kindness and sympathy and hope for the health of someone ailing. Sometimes I pray out loud (and wonder what people think as they pass by this woman talking out loud…walking with no one they can see). I feel so fortunate that every Thanksgiving I’ve celebrated with loved ones – the same meal basically – with the same comments about my mashed turnips (Ugh!, or “Yeah!”) and sighs of bliss for all of the pies. We’ve added people to our Thanksgiving table – our kids’ in-laws, grandchildren – and the love light just gets brighter. Amen. “The love light just gets brighter – I love that, Pam! And Amen to all you’ve written here. I often see people passing by talking out loud to no one they can see; however, I don’t think they are praying but probably talking to a friend via bluetooth connection. On second thought, maybe it IS praying! Just now I returned from a walk in the preserve all bundled up and finding some pine boughs to decorate. Praise to the Creator! Hey, you’ve never had MY turnips. Maybe I’d change your mind. Laughing about the people you see walking and talking (to no one around). Yes, you’re right, I can just pretend I’m talking on my Bluetooth earbugs (which I don’t have – thank you very much) when I’m walking and praying. Sigh. Praying is so much more satisfying. Enjoy those God-given boughs.